Journal of Nanjing Agricultural University, 2019, 42(2): 316-321. 肖航, 王换换, 王凯, 等. 猪血管紧张素转化酶2重组蛋白诱导表达和纯化条件的优化[J]. 南京农业大学学报, 2019, 42(2): 316-321. 通信作者：张源淑, 教授, 博导, 主要从事动物机能和营养的生物化学与分子生物学、反刍动物乳蛋白和乳脂调控机制研究, E-mail:zhangyuanshu@njau.edu.cn. Abstract: [Objectivs] The paper aims to optimize the condition for expression of ACE2 of porcine in Escherichia coli, this study compare the effect of purification of recombinant pET-32a-ACE2 fusion protein from inclusion bodies by KCl gel slices and Ni2+-NTA chromatography, and explore a better method for purifying recombinant protein. [Methods] The recombinant plasmid pET-32a-ACE2 of porcine was transformed into E.coli BL21(DE3) and in order to improve the expression level of target protein, temperature for induction, and concentration of IPTG were optimized. Inclusion bodies of recombinant pET-32a-ACE2 fusion protein obtained were purified by Ni2+-NTA chromatography and KCl gel slices, respectively. 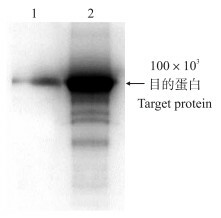 Antigenicity of soluble recombinant protein obtained was identified by SDS-PAGE and Western blot. [Results] The SDS-PAGE result showed that the ACE2 fusion protein expressed under the induction with 1.0 mmol·mL-1 IPTG for 10 h of relative molecular mass approximately 100×103 was mainly expressed in inclusion body. Two methods both could purify recombinant pET-32a-ACE2 fusion protein from inclusion bodies, but the purity and yield of soluble recombinant which was obtained by KCl gel slices were better. 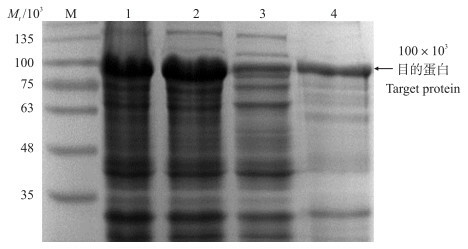 Western blot confirmed that soluble recombinant pET-32a-ACE2 fusion proteins had satisfactory antigenicity. [Conclusions] When the IPTG concentration was 1.0 mmol·mL-1 and the induction time was 10 h, the expression level of pET-32a-ACE2 recombinant protein was the highest, and the purification of the recombinant pET-32a-ACE2 fusion protein from inclusion bodies in KCl gel slices was a relatively simple, effective method. 图 1 不同浓度IPTG诱导ACE2蛋白在大肠杆菌BL21(DE3)上的表达 Fig. 1 Expression of pET-32a-ACE2 fusion protein in Escherichia coli BL21(DE3)induced by different concentrations of IPTG M.蛋白分子质量标准品; 1~7. IPTG诱导浓度分别为8.0、4.0、2.0、1.0、0.5、0.25、0.125和0 mmol · L-1的表达产物; 8.IPTG诱导前表达。 M. Protein molecular weight marker; 1-7. Recombinant pET-32a-ACE2 expression products in E.coli BL21(DE3)induced with IPTG at 8.0, 4.0, 2.0, 1.0, 0.5, 0.25, 0.125 and 0 mmol · L-1; 8. Expression of pET-32a-ACE2 fusion protein before induced with IPTG. 图 2 IPTG诱导不同时间ACE2蛋白在E.coli BL21(DE3)上的表达 Fig. 2 Eexpression of pET-32a-ACE2 induced by IPTG at different time in E.coli BL21(DE3) M.蛋白分子质量标准品; 1~7.分别为诱导0、2、4、6、8、10 h以及过夜的表达产物。 M. Protein molecular weight marker; 1-7. Recombinant pET-32a-ACE2 expression products in E.coli BL21(DE3)induced with IPTG at 0, 2, 4, 6, 8, 10 h and overnight. 图 3 超声破碎后重组蛋白pET-32a-ACE2的SDS-PAGE图 Fig. 3 Solubility analysis of pET-32a-ACE2 fusion protein M.蛋白分子质量标准品; 1.诱导后pET-32a-ACE2重组菌表达产物; 2.诱导后pET-32a-ACE2重组菌超声破碎表达产物; 3.诱导后pET-32a-ACE2重组菌体超声破碎上清液; 4.诱导后pET-32a-ACE2重组菌体超声破碎沉淀。 M. Protein molecular weight marker; 1. Recombinant bacterium; 2. Expression products of pET-32a-ACE2 recombinant bacteria induced by ultrasonic fragmentation; 3.The upernatant of pET-32a-ACE2 recombinant bacteria induced by ultrasonic fragmentation; 4.The deposit of pET-32a-ACE2 recombinant bacteria induced by ultrasonic fragmentation. 图 4 Ni2+-NTA亲和柱(A)和KCl染色切胶(B)纯化pET-32a-ACE2包涵体蛋白SDS-PAGE图 Fig. 4 pET-32a-ACE2 inclusion body protein purified by Ni2+-NTA affinity column(A)and KCl staining(B) A:M.蛋白分子质量标准品; 1~4. Ni2+-NTA亲和柱纯化pET-32a-ACE2包涵体蛋白。B:M.蛋白分子质量标准品; 1.诱导后pET-32a-ACE2重组菌表达产物; 2.诱导后pET-32a-ACE2重组菌超声破碎表达产物; 3.KCl染色切胶纯化pET-32a-ACE2重组蛋白; 4.KCl染色切胶纯化pET-32a-ACE2重组蛋白后反复冻融3次。 A:M.Protein molecular weight marker; 1-4.pET-32a-ACE2 inclusion body protein eluted by Ni2+-NTA. B:M.Protein molecular weight marker; 1.Recombinant bacterium; 2.Expression products of pET-32a-ACE2 recombinant bacteria induced by ultrasonic fragmentation; 3.Recombinant pET-32a-ACE2 fusion protein obtained were purified by KCl gel slices; 4.Recombinant pET-32a-ACE2 fusion protein obtained were purified by KCl gel slices through freezing and thawing 3 times repeatly. 图 5 pET-32a-ACE2重组蛋白的Western bolt鉴定 Fig. 5 Identification of pET-32a-ACE2 recombinant protein by Western bolt 1. KCl染色切胶纯化pET-32a-ACE2重组蛋白; 2.重组蛋白纯化前样品。 1. Recombinant pET-32a-ACE2 fusion protein obtained was purified by KCl gel slices; 2. Recombinant pET-32a-ACE2 fusion protein before purification. 翁智远, 晋学庆, 吴可贵. 肾素-血管紧张素系统的重大发现—ACE2与Ang(1~7)[J]. 高血压杂志, 2004, 12(3): 191-193. 于在江, 马学恩, 周建华. 切胶纯化表达蛋白包涵体的可行性分析[J]. 生物技术, 2007, 17(3): 46-48. Yu Z J, Ma X E, Zhou J H. A modified method for purification of inclusion bodies proteins in gel slices[J]. Biotechnology, 2007, 17(3): 46-48 (in Chinese with English abstract). 柴燕涛, 姜棋予, 谢国明, 等. 包涵体蛋白3种纯化方法的比较[J]. 中国医药导报, 2016, 13(10): 4-6. Chai Y T, Jiang Q Y, Xie G M, et al. Comparison of three methods for purification of inclusion body protein[J]. China Medical Herald, 2016, 13(10): 4-6 (in Chinese with English abstract). 肖航, 王凯, 王换换, 等. 真核表达质粒pcDNA.3.1(+)-ACE2的构建及其在CHO细胞中的表达[J]. 畜牧与兽医, 2018, 50(1): 54-58. Xiao H, Wang K, Wang H H, et al. Construction of eukaryotic expression plasmid pcDNA3.1(+)-ACE2 and its expressions in CHO cells[J]. Animal Husbandry & Veterinary Medicine, 2018, 50(1): 54-58 (in Chinese with English abstract). Bio-Rad Laboratories. Model 422 electro-eluter instruction manual[Z]. Hercules: Bio-Rad Laboratories, 2005: 1-11. 范贵荣, 杨致邦, 田一玲, 等. 两种纯化幽门螺旋杆菌VacA-HpaA融合蛋白包涵体方法的比较[J]. 中国病原生物学杂志, 2009, 4(2): 81-84. Fan G R, Yang Z B, Tian Y L, et al. Comparison of two methods of purifying recombinant VacA-HpaA fusion protein inclusion bodies of Helicobacter pylori[J]. Journal of Pathogen Biology, 2009, 4(2): 81-84 (in Chinese with English abstract). 高慎阳, 李一经. 猪流行性腹泻病毒重组M蛋白膜外区原核表达IPTG最佳诱导条件的确定[J]. 中国畜禽种业, 2008, 4(7): 75-76.